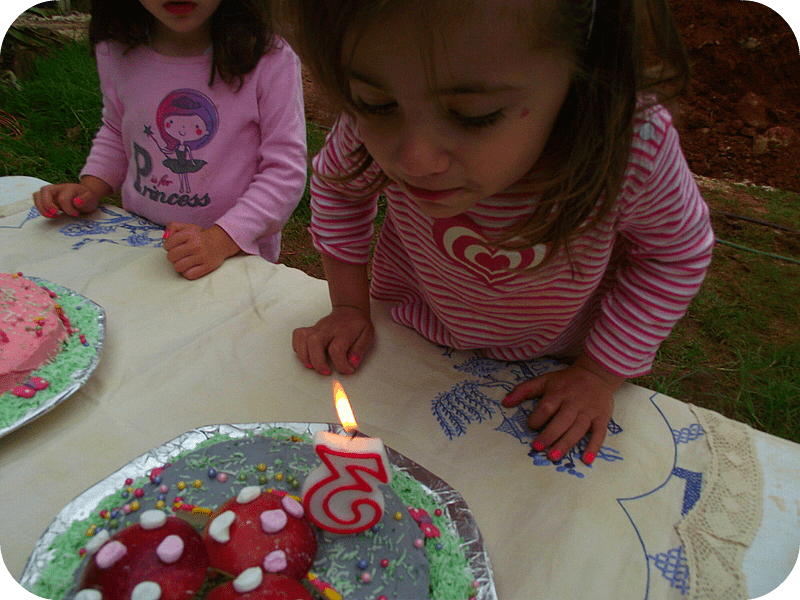 Weekend Wanderings..Vegetable Gardening & Birthday Cakes! We didn’t get much Winter sun this weekend unfortunately, but with the amount of work we need to get done in the backyard we couldn’t let that stop us! This weekend we focused on a little more child friendly planting and getting the children’s vegetable garden ready to plant out. I am hoping this area will become a favourite with family day care children as they learn about plants, food and outdoors. It’s not a huge patch but we tried to incorporate a few child friendly features as we went….. 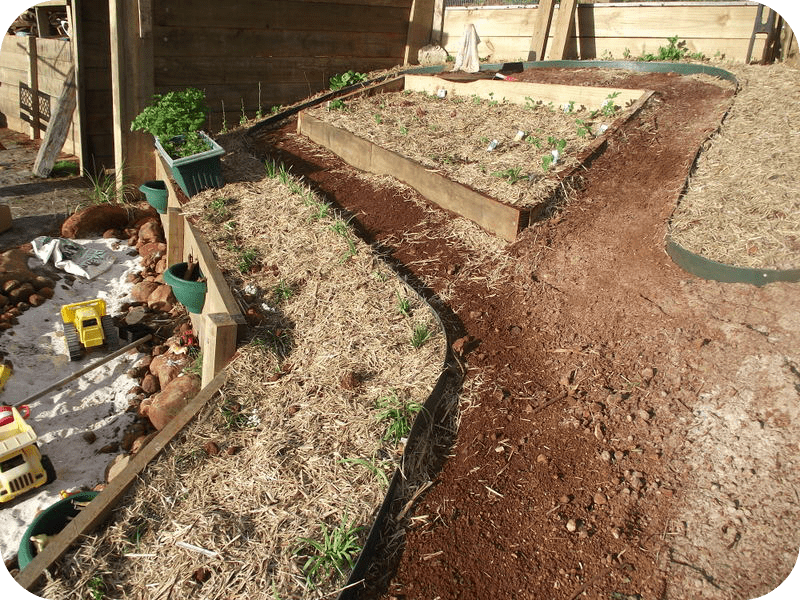 This is the area we had set aside for the children’s vegie patch and as it was rather steep His Patient Self used a few leftover sleepers to make a terraced bed in the middle. As you can see in the pictures above and below, we (well obviously I mean HE but I supervised marvellously I thought!) incorporated some pathways using some flexible garden edging. We are still trying to decide what we will put on the pathways…perhaps crushed granite, perhaps small pebbles, perhaps gravel, perhaps tea tree mulch…not sure as yet!! 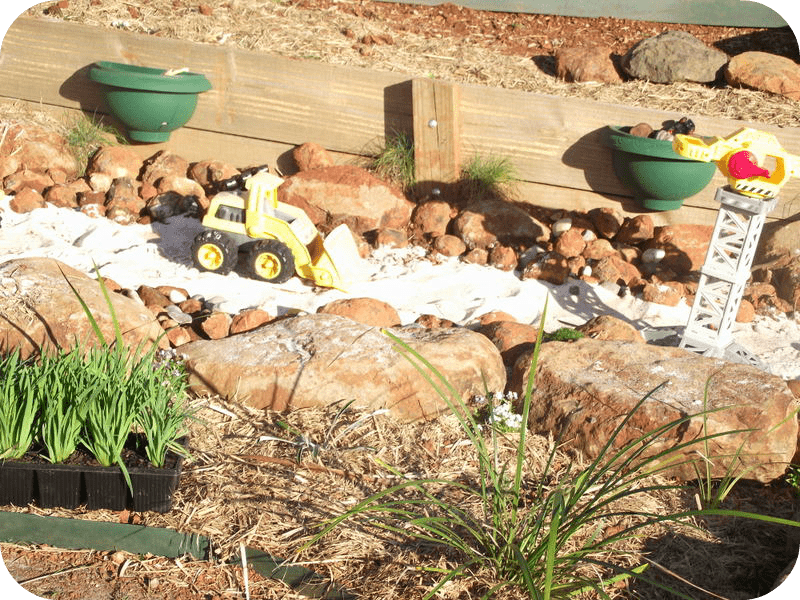 The edging also made a garden bed along our Toddler Rock Quarry area which the girls had a lot of fun helping me to plant out. To keep costs low we are planting small seedlings brought in bulk trays….they will grow bigger in no time at all with some careful watering and love from the toddler twosome! The middle vegie bed is easily accessible around each side so plenty of room for children to reach in and pick goodies or to plant out without needing little feet standing in the middle and squashing the plants. The beds around the boundary are also easily accessible and not to wide. The toddler twosome and I planted some Winter season vegies such as broccoli, zucchini, cherry tomatoes, Asian greens, beans, peas, silverbeet, spinach and a few lovely smelling herbs for that extra sensory experience. When choosing vegetables to plant for children’s gardens I think it is a good idea to consider colour, texture and ease of picking. For example, I chose some red/pink spinach, purple and yellow beans, red cherry tomatoes, yellow and green zucchini and rainbow silverbeet. Lots of colours to explore and talk about with children as they grow. All of the vegetables mentioned above also provide easy picking for little hands and peas and broad beans have the added fine motor fun of breaking open pods to find the peas/beans inside! 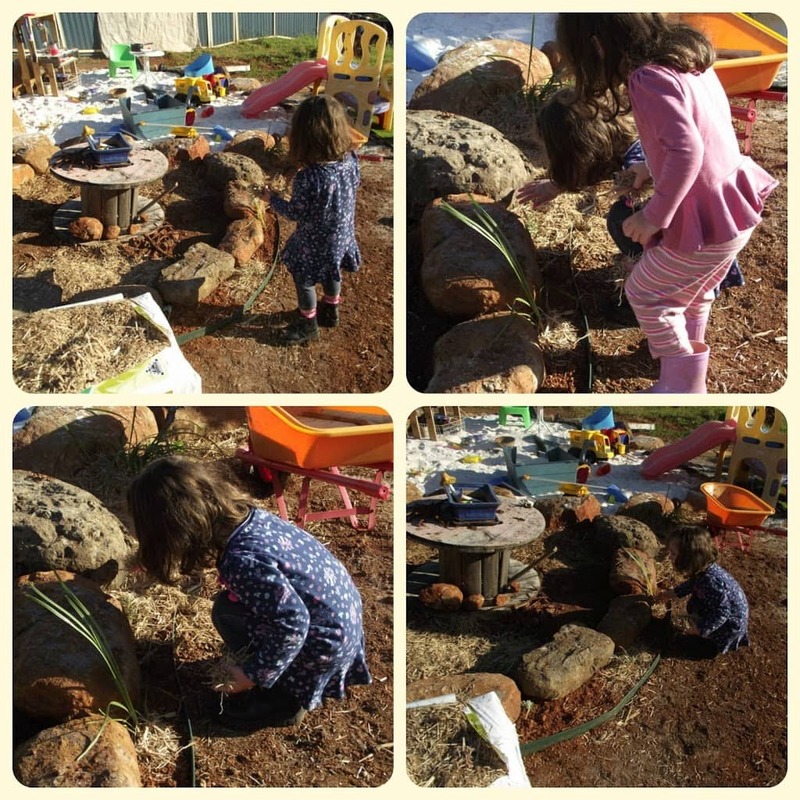 Herbs and lavender have been planted on corners of the garden beds to provide wonderful smells for little sensory systems as they are brushed past or picked to use with the Pallet Kitchen to cook up something special in the sandpit! After planting and watering (or putting them to bed as Ruby calls it!) it was time to spread some mulch, we use sugar cane mulch and this also breaks down beautifully into the soil over time. The girls love this job and can spend ages spreading it around plants and patting down. A few plants do get covered in the process but I just go back and unearth them later….they are doing such important work that I don’t want to point out little mistakes constantly as we go! They also helped me add a few more grassy plants to borders and around the rocks. These are very hardy and that’s what you want when there are lots of little feet around a Sandpit and play areas. As they grow they will also form lovely little shelters and secret spaces. 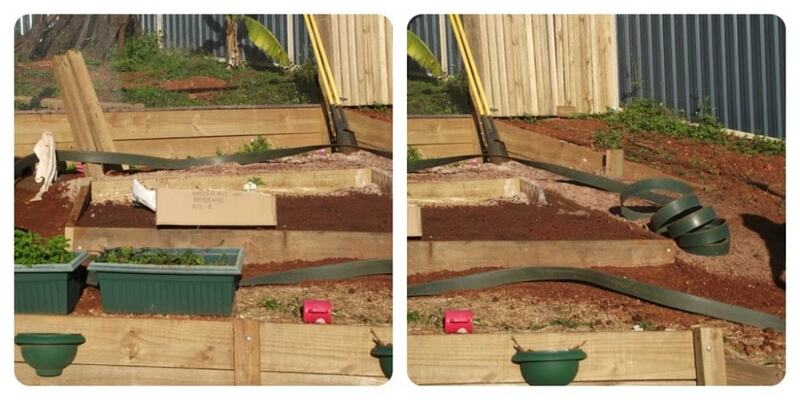 Very important to get your planting and mulching ‘just right’…. 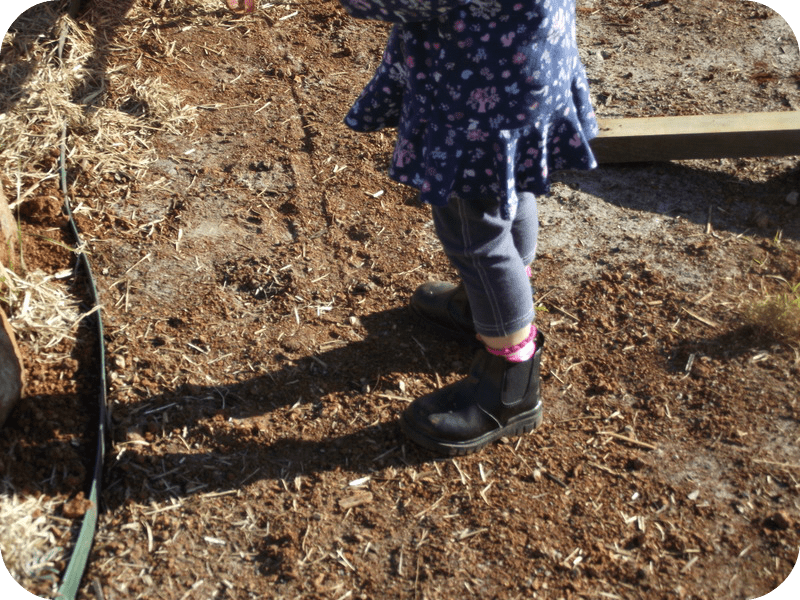 And don’t forget the ‘garden boots like Daddies….’ Don’t they set off a dress just beautifully! 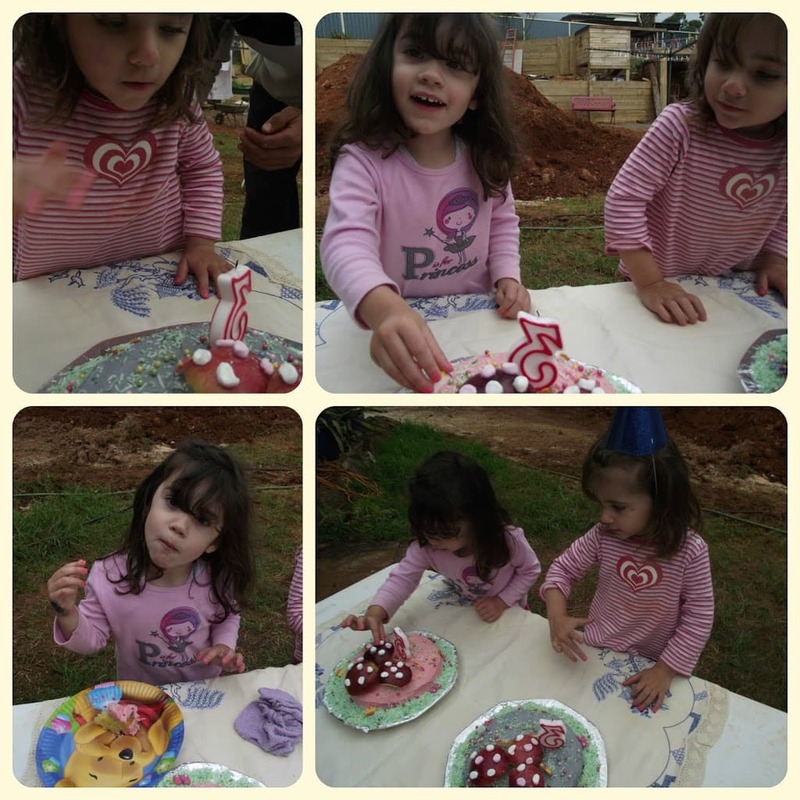 On Sunday we had a small family celebration for the twins Birthday…although Tara tried to tell everyone it was just her Birthday…not sure how to explain the twin Birthday thing as yet….any ideas for me wise parents of twins?? We did yet another trip to Bunnings because believe it or not that is one of the girls favourite places to visit on the weekend and got faces painted, a huge blow up hammer and a big play on the playground….what more could you want on your special day? Unfortunately the face paint was washed off not long after this because it ‘felt funny on my face’. We don’t have family living close by so we chose just to have a little family afternoon tea with some simple whimsical, outdoor themed party cakes, lots of balloons and streamers to play with and of course a little outside fun! 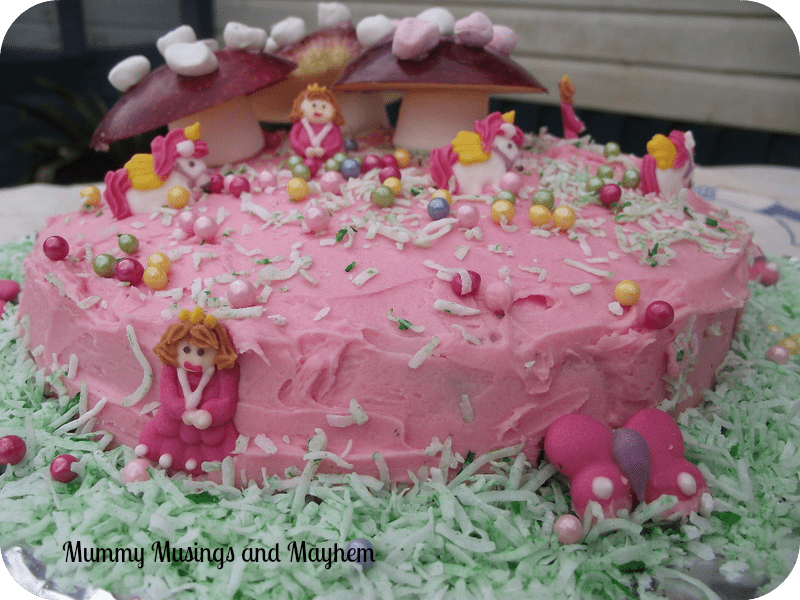 I have decided from now on I will do one cake each for the the girls on their Birthday as I feel it is important to recognise their individual place in our family and the day they came to join us. I’ll start the actual Birthday parties next year….no idea how to handle that one when they have groups of different friends as yet! I love this photo as it highlights their differences so well… Tara (who isn’t that fussed on sweet things) went straight to the apples and Ruby who loves a little sugar (and rarely ever gets it!) was in heaven with the icing. I used my basic Birthday Butter Cake Recipe, made 2 round cakes then iced in butter icing and added a few sugar friends. The little toadstools are just apples and marshmellows. 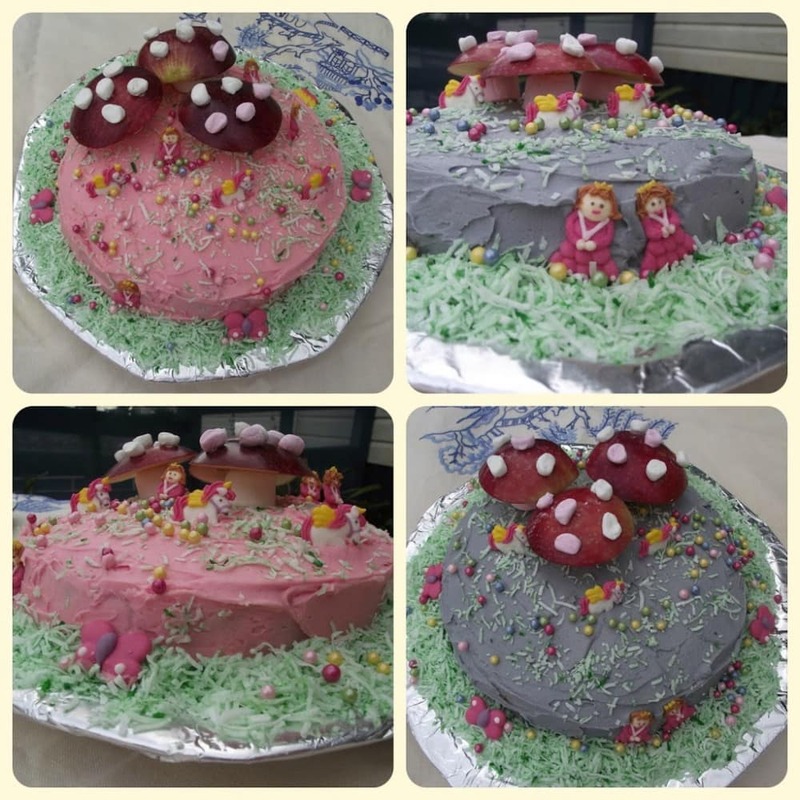 As soon as I saw the toadstools on Kirsty’s fabulous cake over at Bowerbird Blue I knew i had to have a try at making a few for the girls! I added a little coloured coconut for grass too. 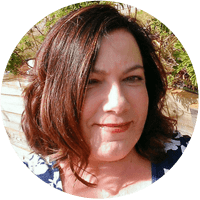 Thanks to lovely Ness over at One Perfect Day I have also now found the perfect butter cream recipe (and you have to check out her recent Star Wars Birthday cake…amazing!!)! 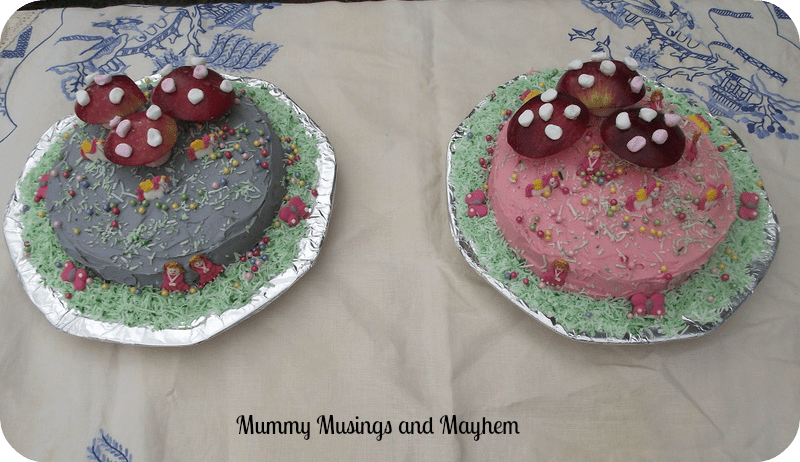 With one tinted purple and one pink the girls had their own special cake to enjoy…..and might I add we have way to much cake in the house now! There were a few little presents to open…. 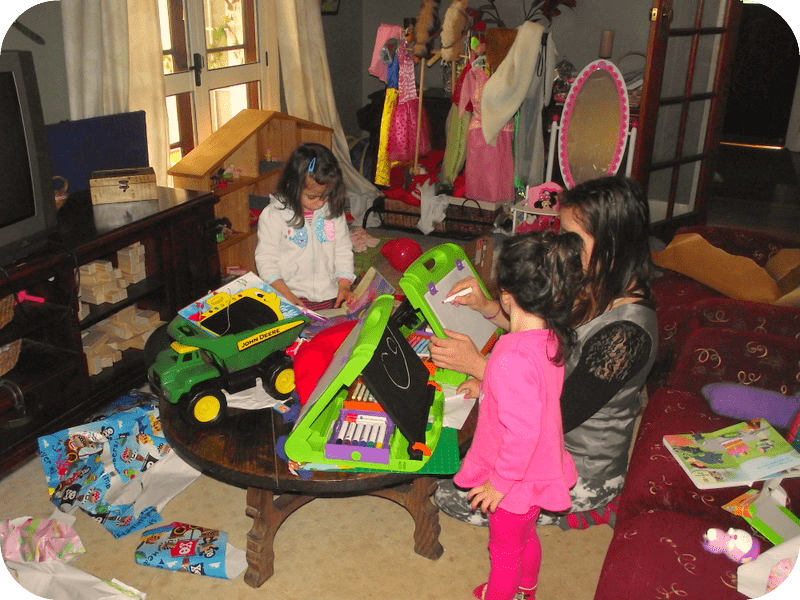 I think Miss Teen may have enjoyed them a little more than the girls…..Those Micador Art Easels from the Big W toy sale have been a fantastic buy, they haven’t left them alone! 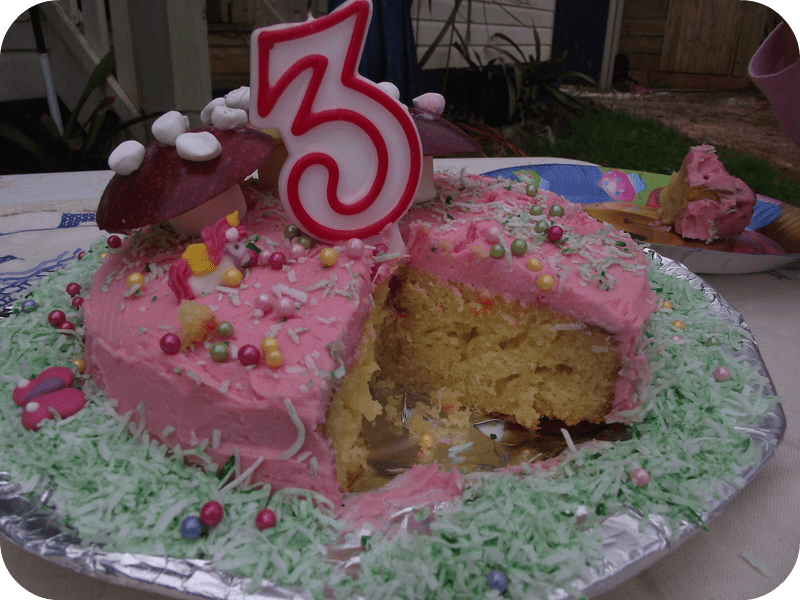 After all the excitement, a little too much cake and Mum and Dad wondering where the last 3 years went so quickly…. 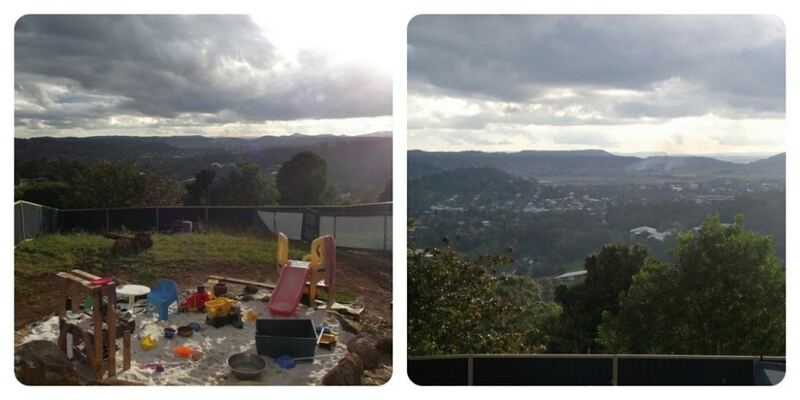 There was just enough time for one last play and a watering of plants before admiring the view from the new vegie garden as the sun went down. 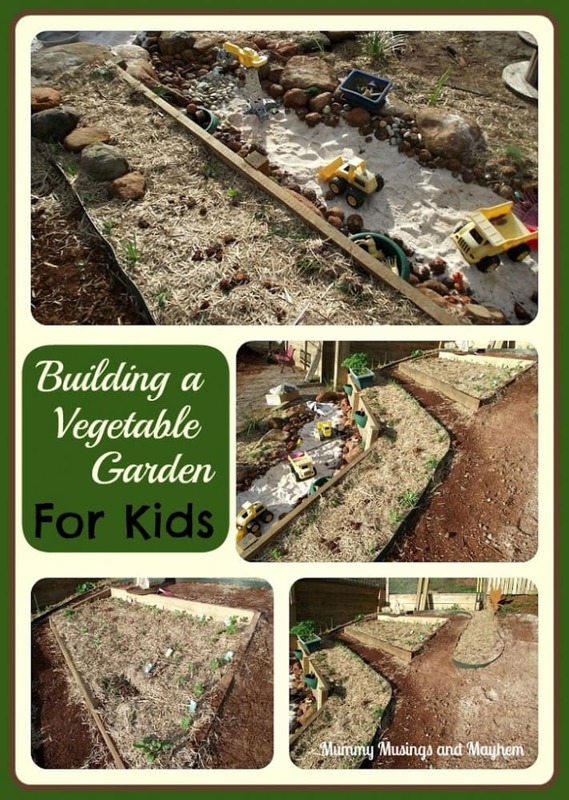 Have you thought about a vegie garden for the kids? 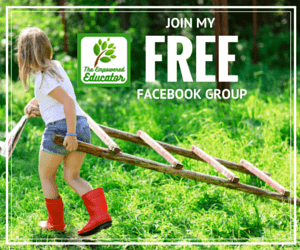 I’d love to hear what you are up to in your own backyard! 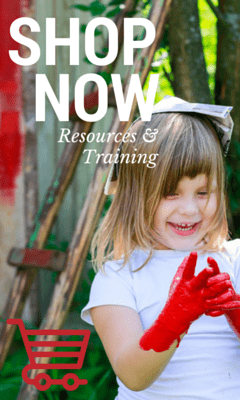 If this is your first visit to Mummy Musings and Mayhem and you like what you see you can follow us on Facebook and Pinterest for more inspiration, frugal fun, recipes and mayhem! « Weekly Kid’s Co-Op..You can .Link up Here! Those cakes look wonderful, I love that you made one for each girl. I think I’ll be pulling out those apple mushrooms for years to come. The vegie patch looks wonderful, I share my patch with the kids if they’re in the mood. We consult them on what they might like to plant and they pluck and munch as they please. They definitely have lost some interest as they have gotten older, requiring a little more persuading. The middle child is happy with digging and mulch moving. 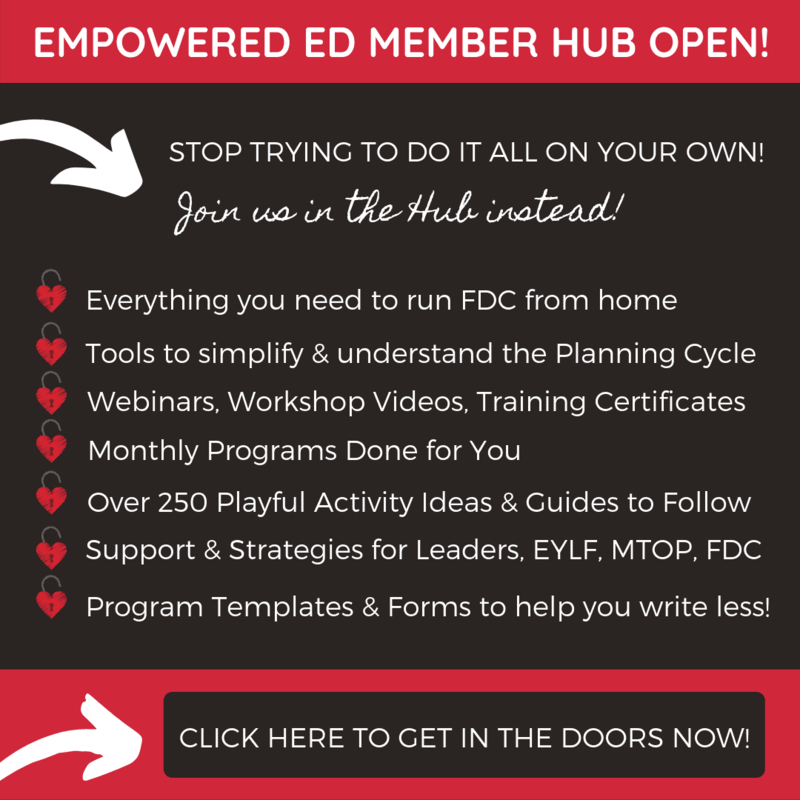 They are such a great idea Kirsty…so glad I saw them on your blog! Know what you mean, Miss Teen has lost interest over the years but is still happy to go out and pick her salad greens each day for lunch! 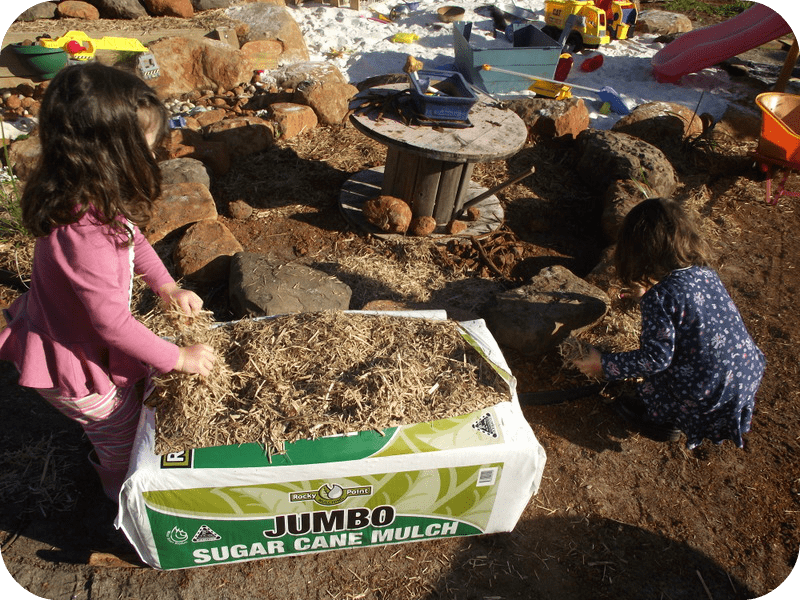 Mulch moving is a fantastic activity for them isn’t it! Thanks Cherine, I love sharing our ideas…wish I could get them finished sooner though!The rock area is so much fun for them…even a small rock area would be fun! 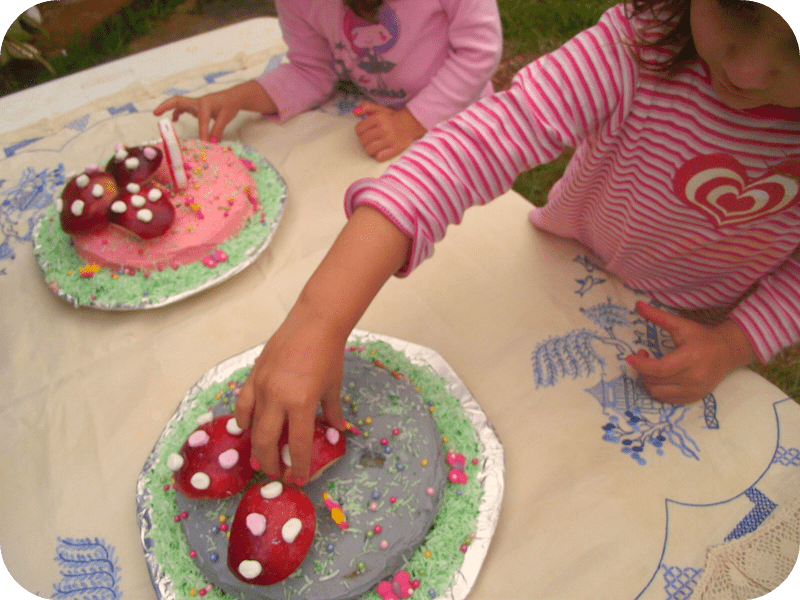 The cakes look so beautiful and I love the apple mushrooms. 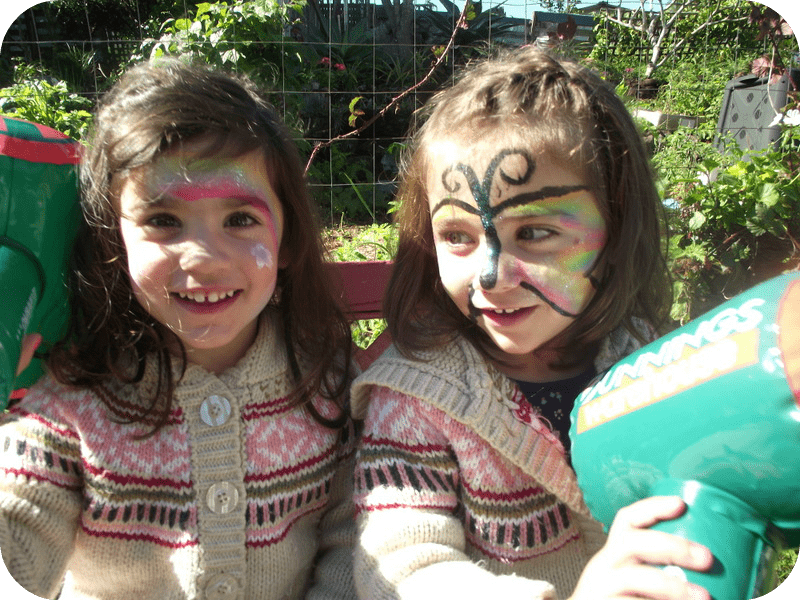 Every year is a big milestone with twins. I remember some of my favourite as when they could get in and out of the car seats themselves and when they could dress themselves. It’s great to have 2 extra helpers in the garden. Thanks Lesley, they did love their cakes! The car seats is currently my stress moment as they need to climb in through the back and organise themselves lol! Dressing themselves is resulting in some wonderful outfits each morning! I adore these cakes! Did you make the sugar people and unicorns? If you bought them, where are they from? The apple mushrooms are too sweet! Hi Rachel…goodness no, I didn’t make the sugar people which is why it was such an easy cake 😉 I found them in my local Woolworths in the cake decorating section. Really great value and so easy! The apple mushrooms were the favourite though I think! Many happy belated to your beautiful girls, I can see they had a fantastic birthday and well done for baking such lovely individual cakes for them. I love the idea of a veggie patch for the children to tend, you are creating a wonderful outdoor are that will cater to all the children’s play needs. Thanks for sharing with Country Kids. Cake looks lush, and your garden is amazing. The much coveted nap time has been dropped around here, so I now have two very rambunctious twin toddlers leaving a trail of destruction from dawn ’til dusk, sigh. So there I was thinking WHAT am I going to do them when I thought of possibly gardening in the afternoons and then I read this post! Great minds, Jode! Also if you have any nap time alternative posts, please guide me to them! Happy Birthday to the fabulous Tara and the gorgeous Ruby! Three times around the sun. Sparkling wishes sent your way, for health, fun and happiness 🙂 Loving those cakes and those awesome mushrooms! A veg patch is a good idea for kiddies. My 2 boys didn’t like many veg before we had an allotment. As they saw things grow they were more interested in eating what we were all growing. They are now both big veg eaters. I love the birthday cakes, looks like they both had a great birthday.